FILE - A rice farmer collects snails and cleans the rice field near Udon Thani, Thailand, Sep. 15, 2015. An international human rights umbrella says the Southeast Asian region faces the threat of growing conflicts over land between investors and local people unless legal and institutional reforms are put in place. 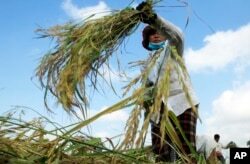 FILE - A Cambodian farmer harvests rice in a paddy on the outskirts of Phnom Penh, Cambodia. FILE - U.S. President Barack Obama makes opening remarks at the 10-nation Association of Southeast Asian Nations (ASEAN) summit at Sunnylands in Rancho Mirage, California, Feb. 15, 2016. Stothard said too often people being arrested and facing trial for illegal assembly are actually farmers protesting the loss of land and homes and forcibly displaced because of inadequate land laws and legal procedures.